German Heavy/Power Metal machine STEEL ENGRAVED, have released a new single & music video for "Where Shadows Remain". The song is taken of their new self-titled album, out on January 25th, 2019 via ROAR Rock Of Angels Records. 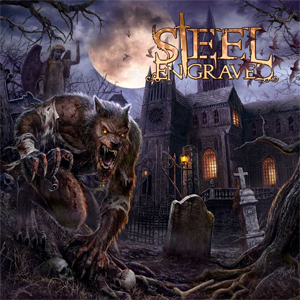 STEEL ENGRAVED‘s third studio outing will comprise 13 tracks guaranteed to please the fans of majestic, melodic, modern yet old-school metal. The video can be viewed on KNAC.COM HERE. The album was produced by Mario Lochert (SERIOUS BLACK) and Jan Vacik (SERIOUS BLACK) at Dreamsound Studios. All vocals produced by Ralf Scheepers at RS Vocal Works. Mixed and mastered by Jan Vacik at Dreamsound Studios. Guest Vocals on “Searching For Regret” by Ralf Scheepers (PRIMAL FEAR). Artwork & illustration by Dušan Markovic (DRAGONY, THOR, JAG PANZER). After the release of their two previous full length albums State Of Siege (debut in 2009) and On High Wings We Fly (2012) it was about time for STEEL ENGRAVED to record their third album! Within those six years, many things happened; the band was very busy touring across Europe as well as playing a couple of one-off shows on different festivals and concerts. So it was never seriously discussed when to start recordings the predecessor of On High Wings We Fly. After a change in the line-up in 2016, the band felt that the time was right to get the spirit alive again!